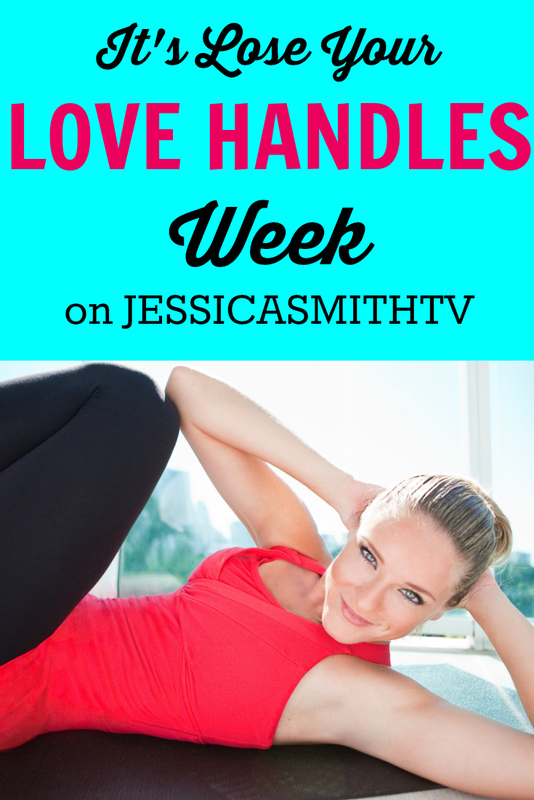 It’s LOSE YOUR LOVE HANDLES Week on JESSICASMITHTV! It’s Lose Your Love Handles Week (which is kinda like shark week, but for your ABS!) and we’ve got a few fun things in store for you to help you celebrate. In honor of Valentine’s Day, we thought it might be fun to put a little extra emphasis on one of our *ahem* “favorite” body parts — the love handles! Join us for a week of core-centric workouts designed to help you work your waistline from every angle. While you can’t spot reduce, you can target that lovely area with a specific plan of action that includes (first and foremost) a healthy diet made up of mostly unprocessed, whole foods, cardio and strength training. Next, take a look at these 50 expert tips to help you get started with some easy ways to start losing your love handles – today. And, finally, your mission (should you choose to accept it) is to complete all of the below workouts by the end of the week (be sure to leave us a comment on the video pages to check in during the week to let us know how it’s going!). Be sure to make this your own – feel free to switch up the order, double up days and/or add in more rest days if needed and of course always listen to your body during the workouts. If a workout doesn’t work for your current level, feel free to sub in another routine anytime. We also recommend walking as much as possible during the day (15-60 minutes). You can spread out your walks into shorter sessions. If walking outdoors doesn’t work for you, be sure to check out our walking DVDs for help squeezing in your extra daily steps. P.S. Can you remove my previous comment and use that one please? I got to know you through your walking videos. Around the end of the year, I visited your website and stumbled upon your workout programs and I decided to start the “Lose the love handles” program. I didn’t know you were so good with ST too! I cannot do your Advance Abs workout yet but, that’s one of my goal for 2017! And I don’t like ST but training with you is always a pleasure! Thank you very much for your comittment and your videos! I got to know you through your working videos. Around the end of the year, I visited your website and stumbled upon your workout programs and I decided to start the “Lose the love handles” program. I didn’t know you were so good with ST too! I cannot do your Advance Abs workout yet but, that’s one of my goal for 2017! And I don’t like ST but training with you is always a pleasure! I have been doing your workouts after my accupuncturist recommended you about 9 months ago. I have had several injuries in the last 3 years, and your workouts are so friendly to my body, I can’t thank you enough. I though I might not be able to work out again, and you have proven to me that I can do most of your workouts. I am so appreciative of your clear instructions, your focus on the whole body, and how to customize for ourselves to keep healthy and strong. I don’t see many men on here, but I want to let you know that you really challenge me to push and get a good burn. I have shard your workouts with SO many people, and I really want to sway THANK YOU!!! I am excited to be doing this challenge this week with a couple of substitutions. Love all the workout !! Just finish the hourglass workout plan yesterday. I’m doing this one this week :D. Love your energy. Keep me going through it !! I did the HIIT workout ….tough but it goes by so quick. I love all the pointers you give, really helps with correct form and you feel it. Thanks! After finishing #FITIN15, I am following Lose Your Love Handles by keeping my workouts core centered. Though most of the workouts are on a level I’m not able to keep up with, I’m subbing in your other core routines and following the flow of the schedule as you suggested. Your workouts leave me feeling amazing! Thank you so much for the amazing workouts! For someone who gets easily bored with the regular gym routines, these are fun blessings in disguise. Looking forward to more exciting ones from you. Just found your workouts yesterday. What a great way to add new moves to my work out and keep the muscles working to discover what’s coming up next! Thank you for keeping the World fit! Thanks so much for this, and for all of your wonderful streaming workouts! I’m an American expat living in Denmark and I’ve been working out at home with videos and DVDs for almost 15 years (since long before moving overseas). Home workouts haven’t really caught on here, so there’s not much available, and your online workouts have been a lifesaver. Thanks Sage! So glad we could be workout partners all the way in Denmark 🙂 Let’s keep moving together! Another great workout (the new kickboxing ballet body sculpt combination). Just love your workouts, sets me up for the day and think the plug and play weekly playlist is such a good idea. Keep up the good work.